Under the vertical equity term, the burden of tax is correlated with capabilities. But the usual philosophy is that the rate of tax must increase with the rate of income. In other words, higher tax must be paid by those who can afford to pay it. Usually, the income tax is based on vertical equity. This is where the richest are expected to pay higher tax because of the higher income they earn each year. Meanwhile, those who have lower income and large families are exempted. This is sometimes explained as an issue that vertical equity creates. The notion is that exemption decreases government revenue. 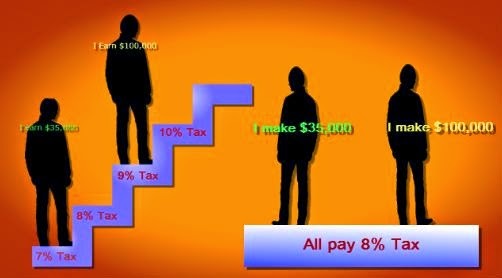 Horizontal equity, on other hand, is based on the theory that two people earning similar amount in income must pay tax in similar percentage. It ignores how each person is earning the income and whether one of them has more responsibilities than the other for which what he earns is actually not enough for him. This supports the theory of neutrality which in turn is said to boost equality and government's economic efficiency. Sales tax is a great example of horizontal equity. No matter how much we make, we pay the same sales tax every time we buy something. Unfortunately, when this tax starts to hurt our wealth we call it regressive.